Get a sense of the local culture at Hamina Old Town and Langinkoski Imperial Fishing Lodge Museum. 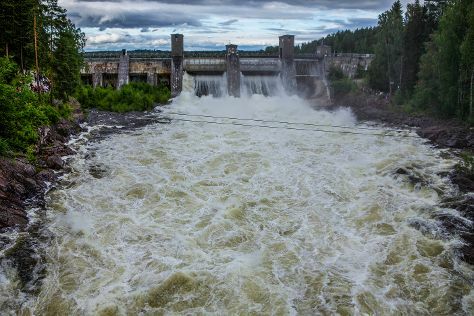 Step out of the city life by going to Imatra Waterfall and Saimaa Canal. Change things up with these side-trips from Lappeenranta: Repovesi National Park (in Kouvola), Lammassaari Island (in Imatra) and Kotka (Linden Esplanade, Maritime Centre Vellamo, & more). There's lots more to do: see the interesting displays at Lappeenranta Fortress, take in the architecture and atmosphere at Church of the Intercession of the Mother of God, make a trip to Sandcastle Lappeenranta, and go for a walk through Stromforsin ruukki. To see reviews, where to stay, more things to do, and more tourist information, read Lappeenranta trip itinerary planning app . April in Lappeenranta sees daily highs of 8°C and lows of -1°C at night. Cap off your sightseeing on the 26th (Fri) early enough to travel back home.